GRIP is a tool for developing computer vision algorithms interactively rather than through trial and error coding. After developing your algorithm you may run GRIP in headless mode on your roboRIO, on a Driver Station Laptop, or on a coprocessor connected to your robot network. 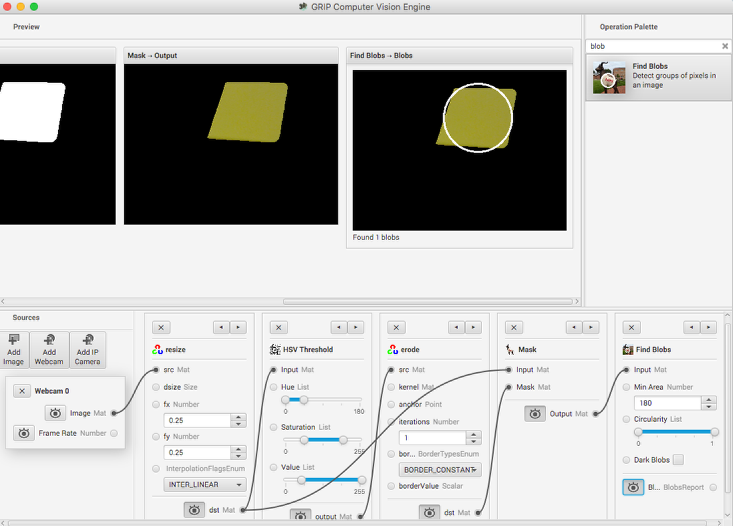 With Grip you choose vision operations to create a graphical pipeline that represents the sequence of operations that are performed to complete the vision algorithm. 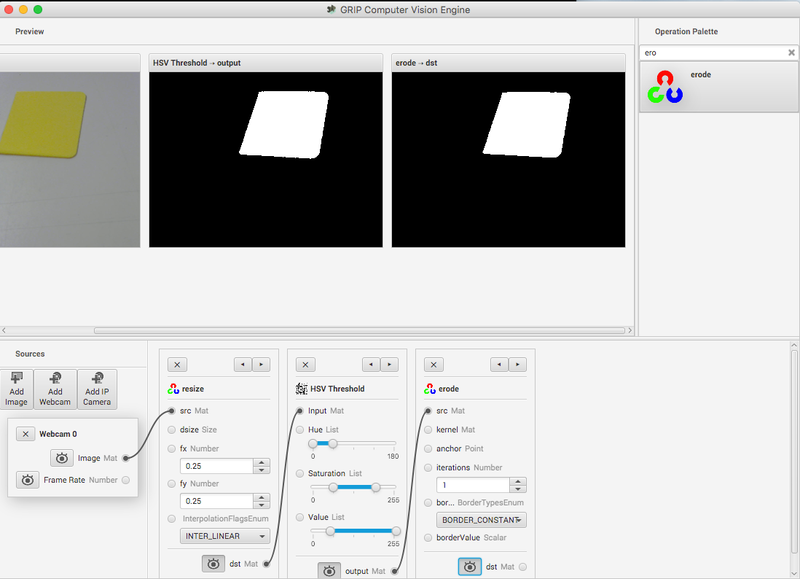 GRIP is based on OpenCV, one of the most popular computer vision software libraries used for research, robotics, and vision algorithm implementations. The operations that are available in GRIP are almost a 1 to 1 match with the operations available if you were hand coding the same algorithm with some text-based programming language. Image Sources are the ways of getting images into the GRIP pipeline. You can provide images through attached cameras or files. Sources are almost always the beginning of the image processing algorithm. 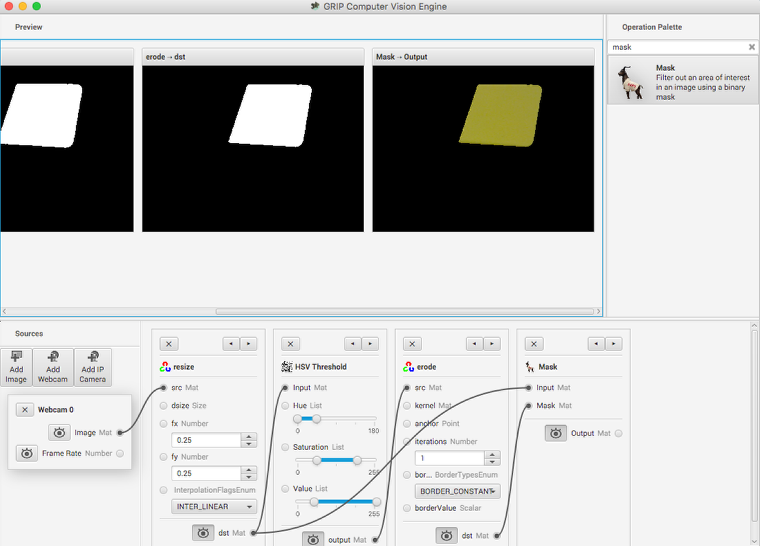 Operation Palette contains the image processing steps from the OpenCV library that you can chain together in the pipeline to form your algorithm. Clicking on an operation in the palette adds it to the end of the pipeline. You can then use the left and right arrows to move the operation within the pipeline. Pipeline is the sequence of steps that make up the algorithm. Each step (operation) in the pipeline is connected to a previous step from the output of one step to an input to the next step. The data flows from generally from left to right through the connections that you create. Image Preview are shows previews of the result of each step that has it's preview button pressed. This makes it easy to debug algorithms by being able to preview the outputs of each intermediate step. In this application we will try to find the yellow square in the image and display it's position. The setup is pretty simple, just a USB web camera connected to the computer looking down at some colorful objects. The yellow plastic square is the thing that we're interested in locating in the image. The first step is to acquire an image. To use the source, click on the "Add Webcam" button and select the camera number. 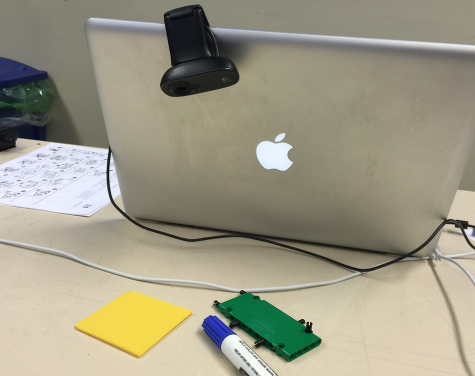 In this case the Logitech USB camera that appeared as Webcam 0 and the computer monitor camera was Webcam 1. The web camera is selected in this case to grab the image behind the computer as shown in the setup. 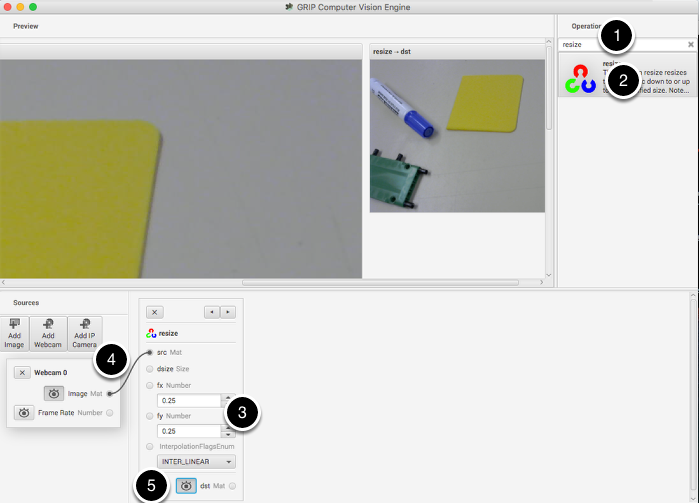 Then select the image preview button and the real-time display of the camera stream will be shown in the preview area. Click the Resize operation from the palette. It will appear in the pipeline. Enter the x and y resize scale factor into the resize operation in the popeline. In this case 0.25 was chosen for both. Drag from the Webcam image output mat socket to the Resize image source mat socket. A connection will be shown indicating that the camera output is being sent to the resize input. Click on the destination preview button on the "Resize" operation in the pipeline. The smaller image will be displayed alongside the larger original image. You might need to scroll horizontally to see both as shown. Lastly, click the Webcam source preview button since there is no reason to look at both the large image and the smaller image at the same time. Type HSV into the search box to find the HSV Threshold operation. 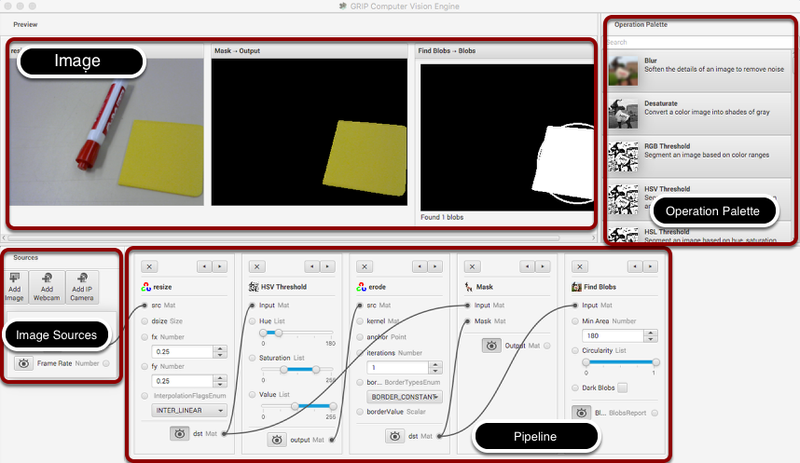 Click on the operation in the palette and it will appear at the end of the pipeline. Connect the dst (output) socket on the resize operation to the input of the HSV Threshold. Enable the preview of the HSV Threshold operation so the result of the operation is displayed in the preview window. Adjust the Hue, Saturation, and Value parameters only the target object is shown in the preview window. This looks pretty good so far, but sometimes there is noise from other things that couldn't quite be filtered out. To illustrate one possible technique to reduce those occasional pixels that were detected, an Erosion operation is chosen. Erosion will remove small groups of pixels that are not part of the area of interest. Here a new image is generated by taking the original image and masking (and operation) it with the the results of the erosion. This leaves just the yellow card as seen in the original image with nothing else shown. And it makes it easy to visualize exactly what was being found through the series of filters. The last step is actually detecting the yellow card using a Blob Detector. This operation looks for a grouping of pixels that have some minimum area. In this case, the only non-black pixels are from the yellow card after the filtering is done. You can see that a circle is drawn around the detected portion of the image. In the release version of GRIP (watch for more updates between now and kickoff) you will be able to send parameters about the detected blob to your robot program using Network Tables. 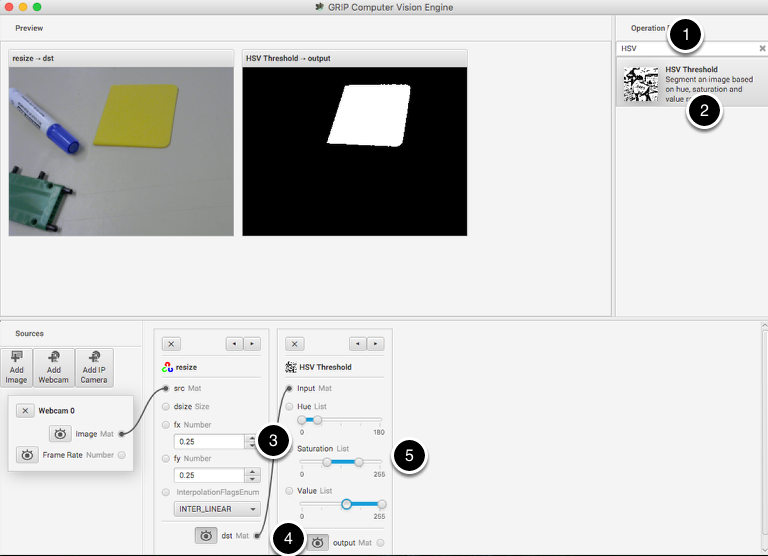 As you can see from this example, it is very easy and fast to be able to do simple object recognition using GRIP. While this is a very simple example, it illustrates the basic principles of using GRIP and feature extraction in general. Over the coming weeks the project team will be posting updates to GRIP as more features are added. Currently it supports cameras (Axis ethernet camera and web cameras) and image inputs. There is no provision for output yet although Network Tables and ROS (Robot Operating System) are planned. You can either download a pre-built release of the code from the github page "Releases" section (https://github.com/WPIRoboticsProjects/GRIP) or you can clone the source repository and built it yourself. Directions on building GRIP are on the project page. There is also additional documentation on the project wiki. So, please play with GRiP and give us feedback here on the forum. If you find bugs, you can either post them here or as a Github project issue on the project page.